Quiet. It’s a quality I have always felt, a characteristic I have always identified with. This isn’t to say I’m not talkative or don’t enjoy long conversations, because I do. But there is something remarkably rejuvenating about moments of quiet, pockets of time to simply think and feel and be. I say what I need to say when I think it’s relevant. I prefer listening to lectures than engaging in group projects or big class discussions. When given the choice, I will likely choose a night in playing games and watching movies to a crazy night of partying. I pride myself on being a good listener, whether or not I have any valuable advice to give the speaker. If I had a dollar for every time someone has called me an “old soul,” my college tuition would be well on its way to being paid in full by now. Although I may be quiet, I certainly wouldn’t consider myself to be an incredibly shy person. Public speaking isn’t my favorite activity in the world, yet I’ll do it when necessary without much fanfare or nerves involved. I recognize when it’s important to be vocal and advocate for myself, especially regarding my severe allergy or when a friend isn’t being treated right. I prefer to stick with a small group of really close friends, although I’ve been fortunate enough to not have much difficulty meeting new people. I like loud music and amusement parks and angrily ranting about my day when I need to vent. So does am I really quiet? Or am I something else? Susan Cain’s book Quiet answers all of these questions and more. Cain focuses on the introvert-extrovert dichotomy often emphasized in personality tests and how that one aspect of our personality influences how we live our lives. Contrary to popular belief, the introvert-extrovert divide is not about how antisocial or social we are; rather, it’s about how we regain energy, how we view the world, how we approach problem-solving, and what we prioritize on a daily basis. As Cain frequently reminds the reader, about one-third of people are introverts. In other words, we are not alone in appreciating the quiet. That’s it! I wanted to exclaim from my seat in the cafe on my college campus. That’s me! That’s how I am! In one short paragraph Cain was able to sum up how I’ve felt for the entirety of my twenty-one years of existence. This feeling of being understood is a large part of what makes this book so powerful. The brilliance of Quiet is that it is not a book solely for those who identify as introverts; rather, it’s a book for anyone curious about how these often serious, often quiet, sometimes surprising people live. Chances are that someone you work with, are friends with, are related to, or even love are an introvert. Wouldn’t it be beneficial to better understand how they view the world? In this way, Quiet is not solely directed at those who want to be understood; rather, it is also directed at those who want to better understand. Cain spends a great deal of time discussing introverts in academic and workplace environments. In this age of “Group-Think,” countless classrooms and workplaces across America are now emphasizing collaboration with others in order to be productive. But Cain challenges this methodology by asserting that group work doesn’t always lead to increased productivity; in fact, constant collaboration with little room for flexibility or privacy may lead to a decrease in individual creativity. Introverts can expel bursts of energy working in groups for short periods of time, but often they will burn out if they are not allowed to recharge by themselves. Unfortunately, the United States today is a culture that prides itself on being extroverted, leaving introverts in quite a dilemma: either pretend to take on extroverted qualities in order to do well in school and at work, or be left to the wayside as a quiet, “antisocial” stranger. 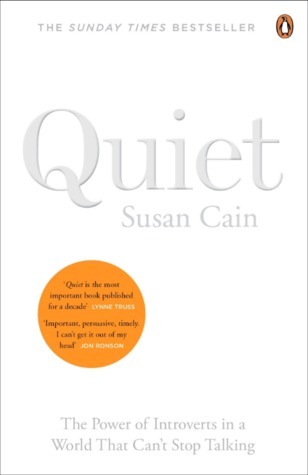 Overall, Cain has done incredible work providing both introverts and extroverts with a guide as to the importance of being “quiet.” As an introvert, I constantly found myself nodding along with her ideas and examples, seeing myself accurately reflected in her words. If more teachers, employers, friends, and family members read Quiet, the world would be a brighter, more productive, less stress-inducing place for introverts everywhere. What are your thoughts on Quiet? Do you consider yourself to be an introvert or extrovert? Let me know in the comments section below! I loved this book so much when I read it a couple years ago. I was just like “FINALLY!!! SOMEONE GETS IT!” I really wish more people read it and not just introverts, but especially extroverts who sometimes really don’t seem to understand why social situations can be so draining. I feel the same way!! The real power of this book lies in the way it can impact extroverts as well. Hopefully it will reach a wider scope of people! Definitely! I hate when people say that leaders have to be outgoing 100% of the time because that’s just not true! I’m definitely an introvert and enjoyed this book quite a bit!! I thought parts of the book were a bit too much focused on cheerleading for other people who identify as introverts (We’re awesome! We do some things better than extroverts! Yay! ), but I did really like the sections on introverts in the workplace and at school and think a lot more people need to read this. Especially with the moves towards, say, open offices (which, as far as I can tell, literally no one likes, even extroverts, and multiple studies have shown everyone hates them and productivity goes down. Yet companies keep purposely remodeling to have an open office plan). I also liked the suggestions for educators to approach teaching introverts. I agree that requiring constant answering of questions in front of 30 other people isn’t necessarily the best way to teach or judge someone’s knowledge or interest. Having taught myself, I do think everyone needs to participate SOMETIMES, and I tried to build my classes so there were small groups, large groups, easy opening questions for shy people to answer something that was “obvious,” etc. And, frankly, I had no sympathy for people who attended literally 25 classes over the course of a semester and never said one.single.thing. in class for 13 weeks and then demanded a 100% participation grade. Talking and interacting with people is still an important skill, even if you are an introvert. Agreed! This book would definitely be helpful for educators. Although, Cain stresses the difference between introversion and shyness, so class participation doesn’t necessarily fall into this dichotomy. I feel like people don’t participate for a lot of different reasons. For instance, someone who is extroverted may not participate in class at all if they refuse to prepare adequately for class. What you said about participation resonates with me so much — as a student, I despise it when participation points were are on whether students would answer questions like, “Now, what is the formula for the volume of a circle?” or “What goes before the evidence in a paragraph?” because I see no way I can gain personal fulfillment in answering those questions. However, if the question happens to about a theme in a novel that requires in-depth analysis or original thinking, not just reciting facts or formulas, then I would happily participate in the class discussion. 😊 If someone doesn’t participate at all and uses their supposed “introversion” as an excuse, though, I think that’s a problem as well. A key part of living in this world is learning to communicate with people who are different than you so we can become more open-minded and get a glimpse about how other people think! 😄 I enjoyed reading your comment! Agreed! As a teacher, I tried to ask a variety of “easier” and “harder” questions to try to appeal to everyone. I agreed with you in school and kind of rolled my eyes at the “review” questions like “Who is the author of the book we read?” because, yeah, what was the point of bothering to answer something that obvious? But I think those kinds of questions can also be really useful for people who know they should be saying *something* in class but don’t want to risk being wrong, so it really varies by student. Really lovely and thoughtful review, Holly! I recognised myself in all the things you mentioned in your first paragraph, and therefore found a lot of acceptance and affirmation in Quiet. Such a great book. I’m so happy you stumbled upon this book and found that it resonated with you — it definitely left a huge impact on me when I first read it 😊 It gave me the push I needed to understand my needs better as a person, as well as to take ownership of my personality type. I will say, though, that the more I think about this book, the more I realize that it’s not the end-all-be-all in understanding your own personality. In fact, I find that calling myself an introvert feels a bit confining. Like you mentioned it above, there is an automatic connection many people make between introversion, shyness, and people being anti-social, and I don’t want that expectation of people to hold me back from effortlessly delivering a class presentation (which I love doing and improving on) or meeting and talking to new people (which I also love doing 😊). I do realize that Susan Cain does a wonderful job showing how introverts can become eloquent conversation makers if they are talking about something they’re passionate about, but I nevertheless want to feel like I have flexibility in exploring who I am without the restrictions of calling myself an introvert, extrovert, or whatever personality type one can claim. Then again, I probably feel this way because I’m very confident in my own skin. Reading Quiet when I was in elementary or middle school would have changed my life for the better, so the more people hear about this book, the better. 😄 I loved how eloquent your book review was, and I enjoyed reading your post! That’s a really great point! Labels are always a bit (or a lot) icky, especially when they feel inflexible and confining. I wish there was a book like this geared towards younger readers– that would have been so helpful! Oh, there actually is a book like Quiet targeted for younger readers! It’s called Quiet Power: The Secret Strengths of Introverts, and it’s also by Susan Cain! I read it as well to see if it was as good as the original Quiet — I still prefer the original one because it’s more detailed, but I definitely would recommend the kid’s version for elementary and young middle school children. 😊 I love how Susan Cain really thought her audience through with her two versions of Quiet! Yes I remember I read this book a couple years ago (and also recognizing some of the studies, just because I was taking a social psychology class at the time haha). I remember this book really blowing me away back when I was in college, especially when I connected and was agreeing with everything! Now, I wonder how I would take it reading it again, because there is a sort of replication crisis going on in psychology nowadays, especially in the field of social psychology. So if I were to reread her book, I wonder if I would be more doubtful of everything she cites. But nevertheless I’m pretty sure this was (and still is) the best non-fiction book I’ve ever read! It was so so well-written and easy to understand! I definitely agree– Susan Cain’s writing is so accessible! I’m glad you enjoyed this book as well!